Pelosi on Wednesday sent a letter to President Donald Trump asking him to submit his State of the Union address to Congress in writing…. 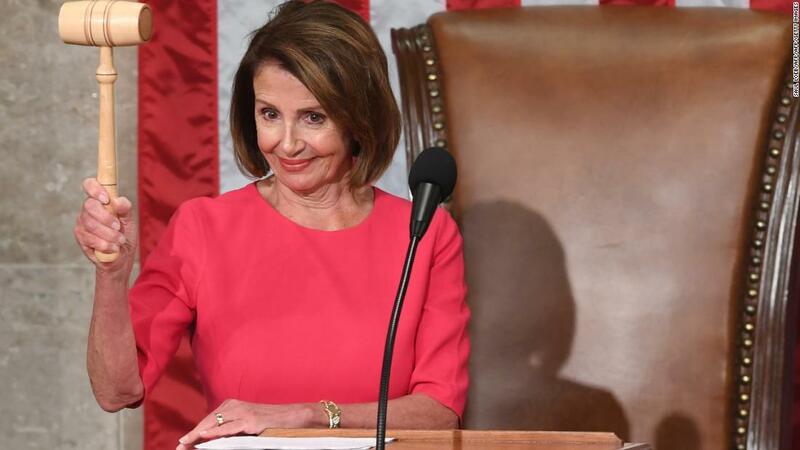 CNSNews: House Speaker Nancy Pelosi on Wednesday sent a letter to President Donald Trump asking him to submit his State of the Union address to Congress in writing, instead of via the traditional speech–or to postpone his speech until after the partial government shutdown ends. Pelosi had previously invited the president to deliver a speech to Congress on January 29th. Now, Pelosi writes, she would like him to provide the address in written form, if he’s not willing to postpone his public address until after the budget battle over border wall funding is resolved. Speaker Pelosi stopped short of rescinding Trump’s invitation to speak on January 29th. Instead, she wrote, “I suggest” that a new date be set, “unless the government re-opens this week,” if he’s not willing to provide a written document to Congress. Pelosi’s letter to the president is provided below and is posted online by Speaker Pelosi here. On January 3rd, it was my privilege as Speaker to invite you to deliver the State of the Union address on January 29th. The Constitution calls for the President to “from time to time give to the Congress Information of the State of the Union.” During the 19the Century, and up until the presidency of Woodrow Wilson, these annual State of the Union messages were delivered to Congress in writing. And since the start of modern budgeting in Fiscal Year 1977, a State of the Union address has never been delivered during a government shutdown. The U.S. Secret Services was designated as the lead federal agency responsible for coordinating, planning, exercising and implementing security for National Special Security Events by Public Law 106–544, December 19, 2000. However, both the U.S. Secret Service and the Department of Homeland Security have not been funded for 26 days now – with criminal departments hamstrung by furloughs. I’d like to know who the idiot Demrats think we elected President, Pelosi, Schumer, Grahm, or one of the other jerks that keep telling the President what he can or can’t do!!!! Trump should give his SOTU speech at the southern border, featuring an unruly pack of invaders carrying foreign flags, throwing rocks and bottles, screaming obscenities, some clawing at the “fence,” others snagged on the concertina wire while dropping someone’s kiddies into the U.S. It might be difficult to concentrate on his speech, but it would give Americans a more realistic sense of our Union’s true state. What gives this illiterate over thee hill Ho the right to order anything of anybody??? She is a HUGE liar, thief, and obstructionist of the highest order!!! This super rich (from American taxpayers) need to take her candy A$$ and hide it behind her walled in home that isn’t even in the district that elected(?) her!!!!! Ms. Pelosi; Thank you for your brief history and subsequent request. Now, go and F**k yourself! NO ONE tells Trump what to do. Least of all a political hack like Pelosi; who, with Schumer, is solely responsible for said shut-down. Now, crawl back under your rock if you must but I suggest you do the job you were elected to do or step aside and let your juniors take the lead. she is going to be DISAPPOINTED. the speech will go forth, and she can sit there and HISS LIKE THE VIPER SHE IS.